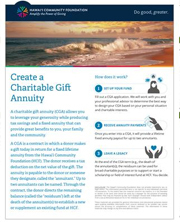 A charitable gift annuity (CGA) allows you to leverage your generosity while producing tax savings and a fixed annuity that can provide great benefits to you, your family and the community. A CGA is a contract in which a donor makesa gift today in return for a fixed lifetime annuity from the Hawai‘i Community Foundation (HCF). 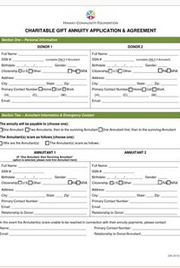 The donor receives a tax deduction on the net value of the gift. The annuity is payable to the donor or someonethey designate, called the “annuitant.” Up to two annuitants can be named. Through the contract, the donor directs the remaining balance (called the “residuum”) left at the death of the annuitant(s) to establish a new or supplement an existing fund at HCF.